In Cantonese, 'SIK' means to eat and 'TENG' means to listen. SIK/TENG is a supper club concept created by friends where food is inspired by music. Each SIK/TENG episode starts with a selected musical album, which inspires the designing of a bespoke menu and a creative direction for the storytelling of the dining experience through experimental film and photography. The creative direction for Episode 1 extends Wolfgang Amadeus' feeling of a 'Paris Summer in LA' into film and photography - playing with themes of colour theory, irreverence and pop inspirations. In design, bringing out the neons and bright colour play, we extended this into the creation of our neon logo which also doubles as a nod to the neon heritage of Hong Kong. 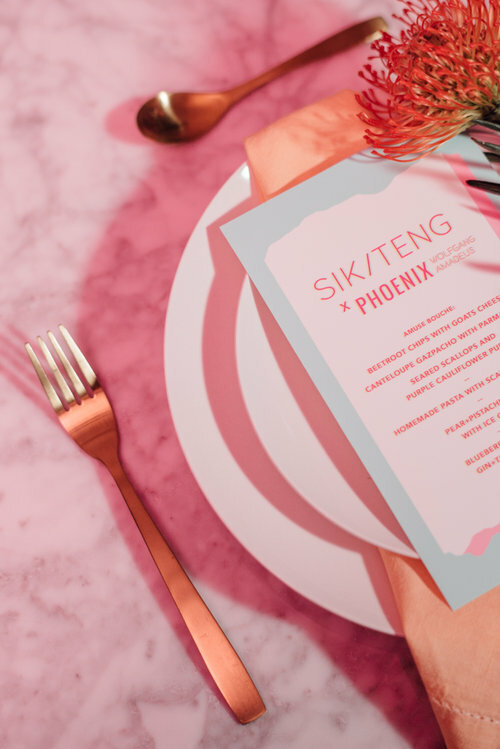 The design aesthetic was translated into the menus, as the event set-up featured tropical green plants and bright orange/pink Coymbia flowers and hand-dyed sherbert-orange linen napkins. The set-up was completed with a curated selection of simple, minimal plates and glassware, accented with brass flatware to fit the colour theme. To learn more on the full story, check out our website SIK/TENG.